"The MJQ will come to a club or concert and play very soft, subtle music and then Blakey will come around like thunder. We're trying to do both, and a few other things besides." 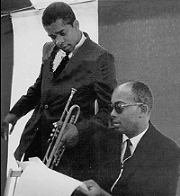 The Jazz Lab Quintet, which Gigi Gryce formed with trumpeter Donald Byrd (initially Idrees Sulieman), lasted through 1957 and left recordings for several labels. Byrd, from Detroit, was a somewhat different and more assertive voice on trumpet than Art Farmer but also meshed well with Gryce's style. In addition, the trumpeter contributed both compositions and arrangements to the unit. Gryce explained the philosophy of this ensemble: "In so far as I can generalize, our originals and arrangements concentrate on imaginative use of dynamics and very strong rhythmic and melodic lines. We try to both give the listener something of substance that he can feel and understand and also indicate to the oriented that we're tying to work in more challenging musical forms and to expand the language in other ways." Most notable among the recordings of the Jazz lab are two done for the Columbia label. The tracks alternate between the quintet and a nonet very similar to the one Gryce had utilized on the 1955 Signal recording. Even some of the material is revisited such as Horace Silver's "Speculation" and the up-tempo "Smoke Signal" which is based on the chord changes of "Lover." Also of note is a captivating medium tempo quintet version of "Over the Rainbow." These recordings have a wonderfully relaxed and powerfully swinging feeling, propelled by the drums of Art Taylor. "An Historical Overview of Gigi Gryce"
A complete discography of albums by The Jazz Lab. Byrd/Gryce Jazz Lab, 1957, Columbia. The Jazz Lab Quintet, 1957, Riverside. Live At Newport, 1957, Verve. The Jazz Lab, 1957, Jubilee. Modern Jazz Perspective, 1957, Columbia.